Presentation is an important part of Japanese cuisine, so adorn your sweet glazed salmon with easy-to-make shallot curls. Place the sugar, soy sauce and mirin seasoning in a medium glass or ceramic bowl. Stir until the sugar dissolves. Add the salmon and turn to coat. Cover with plastic wrap and place in the fridge for 30 minutes to marinate. Meanwhile, thinly slice the shallots lengthways. Transfer to a small airtight container of iced water. Place in the fridge for 30 minutes or until the shallot curls. Preheat grill on high. Line a baking tray with foil. Brush the lined tray with oil to lightly grease. 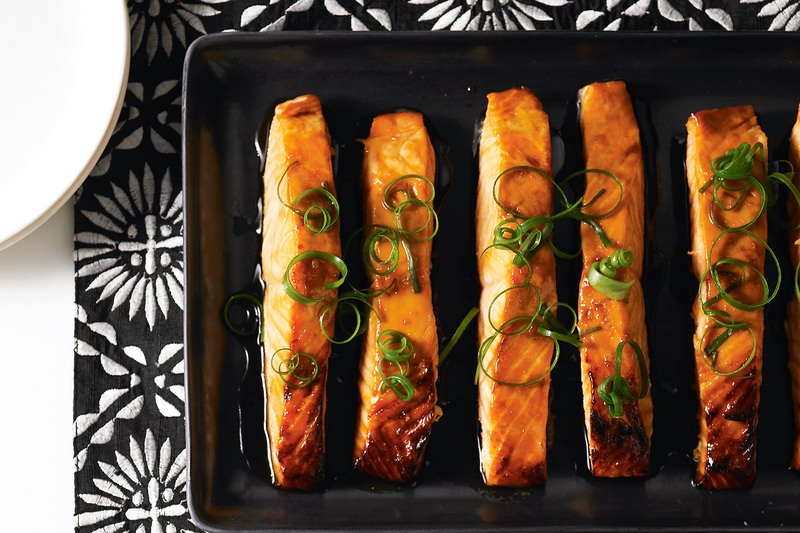 Drain salmon, reserving the marinade. Place the salmon on the prepared baking tray. Cook under grill, brushing the salmon occasionally with the reserved marinade, for 5 minutes or until the salmon is golden and just cooked through. Drain the shallot. Arrange the salmon on a serving platter. Sprinkle with the shallot curls to serve. Time plan tip: Prepare this recipe to the end of step 2 up to 45 minutes before serving. Continue from step 3 up to 15 minutes before serving.